A Great Gray Owl perches in a tree overlooking a field in Newport, N.H., in March 2017. As the headline says, I don’t typically chase rare birds around the region. It’s not that I don’t want to see the birds, but either family or work obligations usually prohibit me from taking long drives to see a bird. Hoop and I followed the directions and arrived at the scene at about 6:20 a.m. A rare bird alert message posted at 6:15 a.m. confirmed that the bird was indeed there. I was minutes away from seeing my first Great Gray Owl. We walked a short distance down a trail, saw a handful of people and joined the small crowd. Sure enough, there was the owl, sitting in a bare deciduous tree surveying the field and ignoring his fans. At one point it flew to another nearby deciduous tree and then eventually flew another short distance to a pine tree. The wind was strong and snow squalls came and went, but otherwise it was a rather pleasant day for the owl and his human visitors — especially for New Hampshire in early March. I was hoping to see one more flight, but time was short. I had to drop off Hoop and drive the 3 1/2 hours back to Connecticut to get to work in the a.m. So by 10:30 a.m. 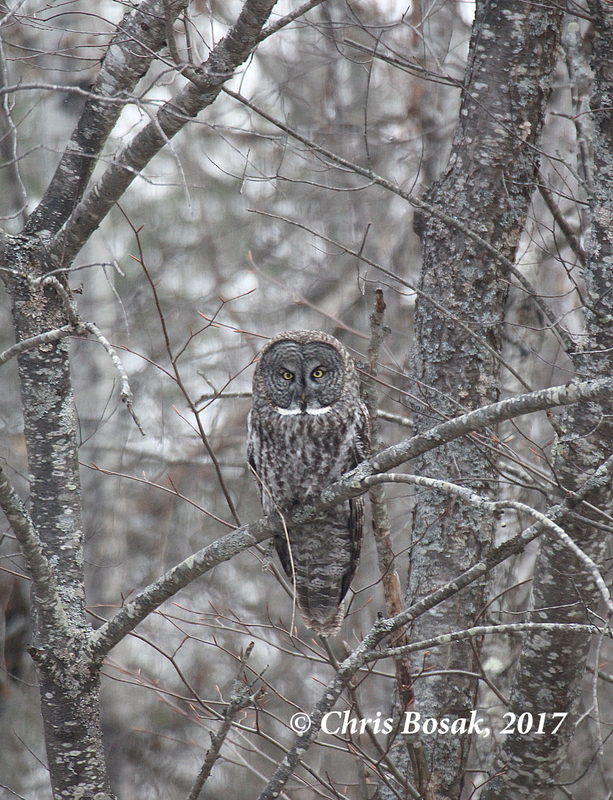 I had driven to New Hampshire and back, and saw my first-ever Great Gray Owl. Just the old days. Here are a few photos with more to come in the days ahead. 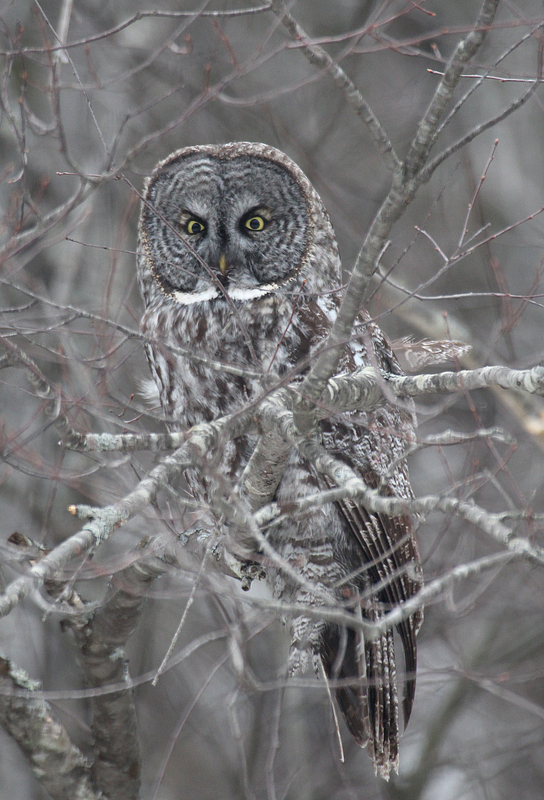 Also coming soon is more information on the Great Gray Owl as a species. No promises on how long it will stick around, of course, but here’s a link to a news story about the owl with directions on where to find it. And here’s the link to the ABA’s Rare Bird Alert with updates on the owl (and other sightings). A Great Gray Owl perches in a pine tree in Newport, N.H., in March 2017. 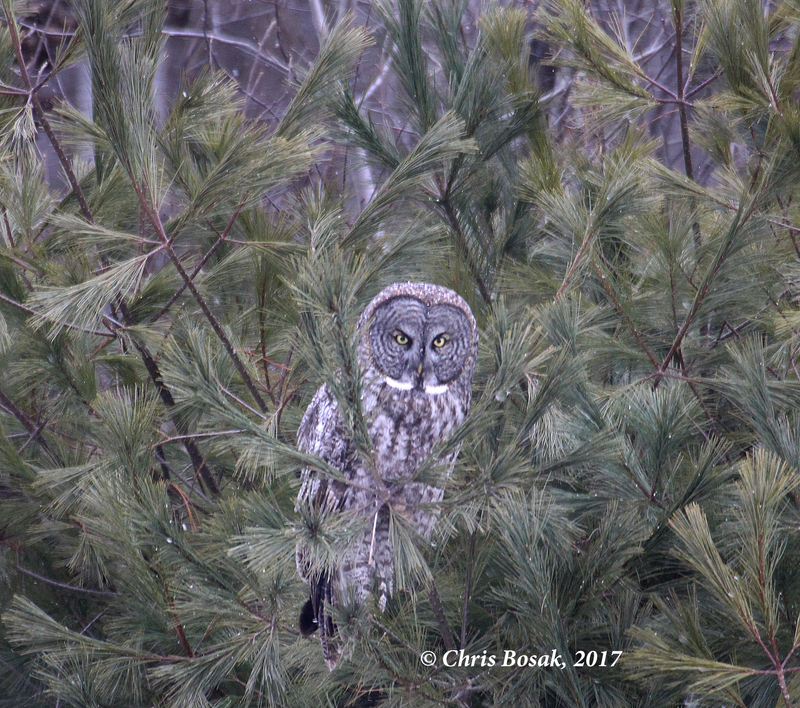 This entry was posted in Boreal birds, new england birds, Owls, Winter in New England and tagged Chris Bosak bird photographer, Great Gray Owl, Great Gray Owl Newport N.H., New England owls, Owls by Chris Bosak. Bookmark the permalink. To judge from the photos, it was worth the trip! It was — thanks Brian.